(Natural News) Chayote (Sechium edule) is an uncommon vegetable that belongs to the gourd family. Since it has a very mild flavor, it can be used in various dishes and cooked in different ways. According to a study, the versatile chayote can also be used to treat skin cancer. The study was conducted by biology students from Universitas Gadjah Mada (UGM) in Indonesia. Dr. Budi Setyadi Daryono supervised the study through the Students Creativity Programme UGM 2017. Lentigo maligna melanoma is a type of severe and malignant skin cancer that spreads rapidly. According to the World Health Organization (WHO), there are at least 3,300 new melanoma cases reported annually in Indonesia. Melanoma may appear on normal skin or start from a mole. However, people don’t always notice how a normal mole changes into melanoma, which can result in unreported and undiagnosed cases. To address this concern, a group of biology students from UGM tried to find a natural cure for lentigo maligna melanoma. 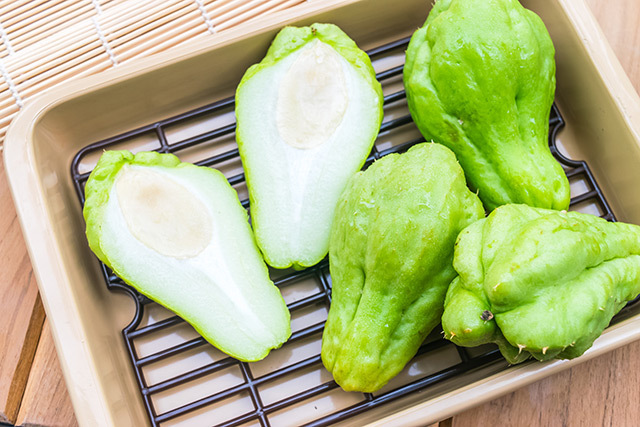 For the study, the researchers used chayote to make an ointment that can help treat melanoma. Dwi Jami Indah explained that they used chayote because it is a common agricultural crop in Indonesia. While the vegetable is often used in various dishes, chayote skin remains underutilized even though it contains latex that is beneficial for the health. In fact, chayote has flavonoid and saponin compounds. These secondary metabolite compounds can be used to prevent skin cancer. To determine the anti-cancer compounds in chayote, the students ran qualitative, quantitative, and anti-proliferation tests using the cell line that has the same proliferation character as the cancer cell. The research team used chayote paste as a test sample. The researchers performed a thin layer chromatography test for the qualitative test. Meanwhile, they ran a spectrophotometric test for the quantitative test. For both tests, they divided chayote into three parameters based on the fruit size. The researchers operated under the assumption that a bigger chayote is older, compared to other samples. Using the research data, the UGM students successfully produced Selasih Lalat, a chayote ointment that can be applied on cancerous moles. The students hope that their research can inspire others to use natural materials when developing cures for different conditions. What is lentigo maligna melanoma? Lentigo maligna melanoma refers to a type of invasive skin cancer. This condition develops from lentigo maligna or Hutchinson’s melanotic freckle. Lentigo maligna often develops on the outer surface of your skin. However, when lentigo maligna starts growing beneath the skin’s surface, it develops into lentigo maligna melanoma. The latter is the least common type of melanoma. While lentigo maligna grows slowly and is usually harmless, lentigo maligna melanoma may spread aggressively. The exact cause of lentigo maligna melanoma remains unknown, but experts posit that sun exposure is the biggest risk factor for developing this type of skin cancer. Individuals with sun-damaged skin and people who spend a lot of time outdoors are at high risk of developing lentigo maligna melanoma. You can read more articles about chayote and other natural cures that can help prevent skin cancer at Cancer.news.